Leukaemia: how can stem cells help? Patients with leukaemia were among the first to be given a treatment where transplants of blood stem cells made it possible to obtain cures. Today this form of therapy is given to thousands of patients with leukaemia around the world. But many difficulties remain. Ongoing research aims to increase our understanding of many malignant diseases of the blood-forming system and improve their treatment. What are the latest advances and what are the remaining challenges? Leukaemia is a general term that refers to many different types of blood cancers with different causes, different treatments, and different outcomes. Acute leukaemias are characterized by the production of abnormally elevated numbers of blood cells that do not function properly and often suppress the production of normal blood cells. Present stem cell treatments for severe leukaemias may include the application of a blood stem cell transplant (also known as a haematopoietic stem cell transplant or a bone marrow or cord blood transplant). Thousands of leukaemia patients worldwide have received successful transplants containing blood stem cells. Although these treatments still carry very serious risks, these risks have greatly decreased over the years as researchers learn more about leukaemia and blood stem cells. Researchers now know most of the gene mutations that are most likely to be present in any given type of leukaemia. Studies continue to examine haematopoietic stem cells (HSCs) and what turns them (or their daughter cells) into leukaemia cells. To reduce current limitations of HSC transplants, researchers are examining new approaches. These include the development of treatments with immune cells, ways to boost patient immunity, and ways to restore blood cell production more rapidly in more patients using either current or alternative sources of cells for the transplants. The latter approaches include strategies to expand HSCs in the laboratory or to derive HSCs from cells called induced pluripotent stem cells (iPSCs) that are immortal cells that are now readily generated in the laboratory. Immediately before a transplant is performed, the blood and immune system of the patient is largely destroyed by chemotherapy. This makes the patient unable to combat infections until the transplanted cells have regenerated the mature cells required to provide this capacity. An ongoing challenge is reducing this vulnerability of patients to infection while transplanted HSCs rebuild the patient’s immune system. A second major challenge is caused by minor genetic differences that may exist between the transplanted HSCs and the patient, even when donor and patient tissue types are highly matched. Such differences can create unanticipated serious incompatibilities that lead to rejections of the transplanted cells or the transplanted cells attacking the patient’s tissues. This situation is called graft-versus-host disease, and it can be fatal in extreme cases. How are healthy blood stem cells used to treat leukaemia? Leukaemia is a term used to describe many different kinds of cancers of the blood. However, in all of these diseases, too many white blood cells (also called leukocytes) are produced and these leukaemic cells do not mature normally. In the most serious types of leukaemia, these cells look like normal immature cells called blasts. But because they remain stuck in an immature state, these leukaemic blasts are not able to perform the functions of normal mature blood cells, which is to defend the body against infection and disease. In most forms of acute leukaemia, these leukaemic blasts accumulate in the bone marrow as well as in the blood and also suppress the formation of normal blood cells. The production of excessive numbers of cells in the blood and the lost ability to fight infection is what makes leukaemia rapidly fatal if not successfully treated. Acute leukaemias are diseases in which the leukaemic cells are rapidly growing and therefore need to be treated right away. They are usually sub-classified as acute lymphoblastic leukaemia (ALL) or acute myeloid leukaemia (AML) depending on the types of white blood cells that are affected. Chronic leukaemias are diseases in which the leukaemic cells are growing more slowly and may still allow normal blood cell production to occur. Therefore, the symptoms may be much milder and the presence of the disease may escape diagnosis for several years before being detected. Chronic leukaemias are usually also sub-classified as either chronic lymphocytic leukaemia (CLL) or chronic myeloid leukaemia (CML) according to the types of white blood cells that are affected. In addition, there are also other types and subtypes of leukaemia that have intermediate symptoms and pathology. Both chronic and acute subtypes of leukaemia may develop in early childhood and then with increasing incidence as people get older. However, the properties of the leukaemic cells that arise in very young children are also somewhat different from those that arise in adults and their treatment is also more challenging. Like most cancers, leukaemias are caused by a series of rare mutations (changes) in certain genes. These generally arise spontaneously at a very low rate inside primitive blood cell precursors throughout life. Very rarely, a mutated form of one of these genes may be inherited. When this happens the individual is highly predisposed to develop leukaemia. Other known, but also rare causes include accidental exposure to radiation or prior treatment with some types of anti-cancer drugs. However, in order for a full blown leukaemia to develop, it is thought that several changes usually have to be accumulated in order to permanently alter the programs that control normal blood cell production. A large number of gene mutations have been linked to causation of human leukaemias, and in some cases, the same mutation is consistently and uniquely associated with a particular type of leukaemia. Chronic myeloid leukaemia (CML) is an example of a leukaemia where knowledge of a shared mutation led to the development of a drug (Gleevec) that is very successful in killing the leukemic cells in patients that are diagnosed with early stage (chronic phase) CML. However, in most patients with other types of leukaemia, the diversity of mutations that are present in their cells has made the development of effective “targeted” therapies more challenging. Because many types of leukaemia are thought to require several rare mutations in order to develop, the first change is assumed to occur in a cell that will remain in the body for a long time. A prime candidate group of cells are the most primitive blood cell precursors - also called haematopoietic stem cells (HSCs). HSCs are responsible for making new blood cells in our bodies for our entire lives. If a stem cell is affected by a genetic change, all the cells it produces will inherit the same mutation. It has been shown that CML starts with a particular mutation in an HSC. However, the daughters of that first cell to be mutated then go through a number of steps to develop into mature white blood cells. The acquisition of new mutations can happen at any of these steps. 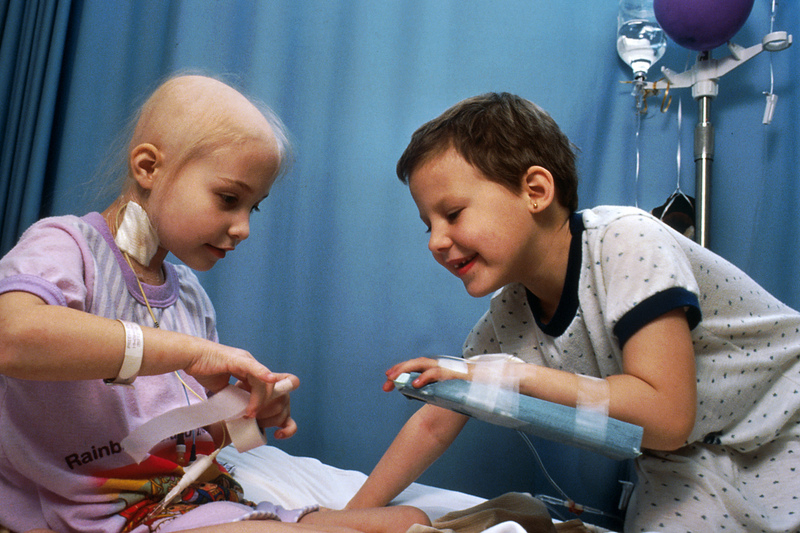 Acute leukaemias usually require immediate and intensive treatment. Depending on the particular type of leukaemia and many other things about the individual patient, treatment options might include chemotherapy, steroids or a more intensive procedure involving high-dose chemotherapy followed by a transplant of healthy HSCs. High-dose chemotherapy is the most effective currently established method to kill leukaemic cells and can cure some patients. However, it also severely damages the remaining normal blood-forming cells in the bone marrow. To replace these cells, patients are given a transplant that contains both HSCs as well as other important cells that contribute to the therapy. The cells for the transplant can be collected from the blood or bone marrow of a healthy donor. Such transplants are effective because they contain important immune cells that help to kill the leukaemic cells in addition to different subpopulations of HSCs that rescue blood production at different rates. A patient’s own cells can sometimes also be used for the transplant, if it is possible to collect enough healthy cells before the treatment is performed. If a different donor is needed, they must match the patient’s tissue type in order to reduce the risk of the transplanted donor cells being rejected. Intensive chemotherapy followed by a HSC transplant continues to be one of the most effective ways of treating many types of acute leukaemia. However, the side effects of the procedure itself make it risky with the potential for early fatality and usually substantial after effects in long-term survivors, particularly in children. Therefore, this type of therapy is only considered when excellent matched donor cells are available and the features of the disease put it into a poor prognosis group. Infections - The transplanted HSCs take time to produce the numbers of mature blood cells required to combat infections effectively, even when given “growth factors” that speed up this process. In the interval that thus inevitably precedes recovery, the patient is highly vulnerable to infections. Careful observation, restricted access to other people and preventative treatment with antibiotics are used to reduce infection risks. Graft-versus-host disease (GvHD) – This complication occurs when donor blood cells attack the patient’s own normal tissues. Symptoms include rashes, diarrhoea, blisters and fever. GvHD is a serious complication and can be life-threatening. It is minimized by closely matching the tissue type of the donor to the patient. This is easiest to achieve if the patient has a matched sibling. Other strategies to prevent GvHD include suppressing the immune system with drugs and removing a specific type of white blood cells (lymphocytes) from the initial transplant. However, it is now clear that the transplanted immune cells also play a critical role in eliminating the patient’s leukemic cells. So a big challenge lies in obtaining a useful balance between achieving an effective graft-versus-leukemia (GvL) effect and a minimal GvHD effect. Researchers and doctors are investigating ways to improve current transplantation approaches in order to address these limitations. Another challenge is the shortage of donors and several organisations are working to increase the number of volunteers in donor registries. The high dose of chemotherapy given to leukaemia patients before a transplant is destructive to both the leukaemic cells and the patient's healthy bone marrow cells. Newer forms of transplantation called mini-allografts or reduced-intensity allografts have been developed to reduce the effects on the normal cells and boosting the GvL effect of the transplant. These procedures allow lower doses of chemotherapy to be used, which helps reduce the extent of damage to the bone marrow. Then, donor immune cells are transplanted with and after the donor HSCs to attack and eliminate any remaining leukaemic cells. This type of transplant has fewer side effects but some serious ones remain, particularly GvHD. Several new techniques are now being tested in patients to see if they will prevent or reduce the severity of GvHD. Certain types of immune cells (regulatory T lymphocytes) that have a suppressive effect on the immune system may be administered to the patient. This can help prevent the donor immune cells from attacking the patient’s own cells. Alternatively, attempts are being made to selectively remove the immune cells that cause GvHD from the initial transplant. Creating genetically engineered immune cells designed to specifically kill patients’ leukaemic cells, particularly for certain lymphoid leukemias is also now showing great clinical promise. Scientists and doctors are also currently investigating treatments that might reduce the time it takes for the patient’s immune system to recover after a HSC transplant. Patients are now routinely given certain selected proteins called growth factors, which can enhance the production of cells needed to fight infections. This can help reduce the risk of infection while the patient recovers. Another active area of research is the development of methods to expand HSCs in the laboratory. This strategy is of particular interest for enabling the use of cord blood cells collected and being frozen in a useful form from births taking place all over the world. These cells have very potent regenerative properties but are present in insufficient numbers to be widely useful in adults unless given as a combination of several collections. Stem cell research is a rapidly developing field. New technologies such as the production of induced pluripotent stem cells (iPSCs) or producing HSCs by direct conversion of other cell types into HSCs are already being developed and used in the lab to study how normal human HSCs are maintained, and how human leukaemia arises. These studies are anticipated to provide new information about these cells, and thus how to design and test new, potentially more effective and less toxic therapies. Such research could revolutionize many of the current shortcomings of current transplants and lack of matched donors. This factsheet was created by Christine Weber in 2013. Reviewed in 2013 by Connie Eaves and Linda Barber. Reviewed and updated in 2015 and 2018 by Connie Eaves. 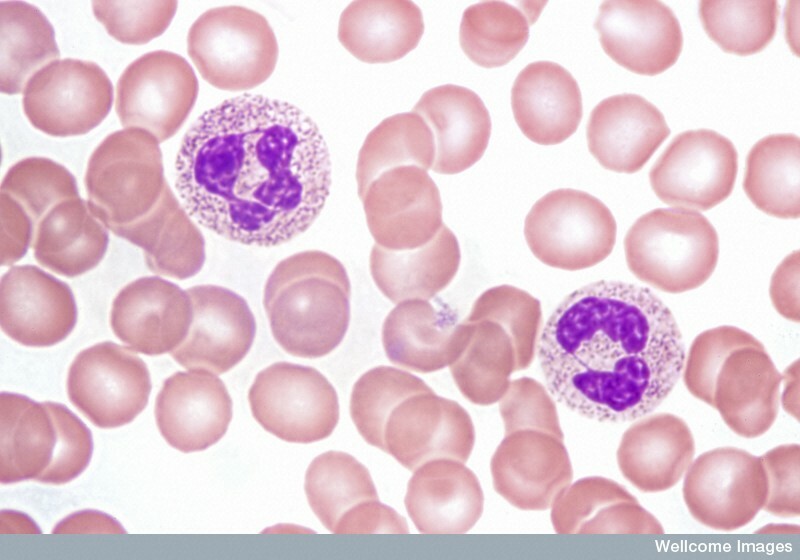 Lead image of blood in chronic myeloid leukaemia by Junia Melo/Wellcome Images. Healthy blood by Spike Walker/Wellcome Images. 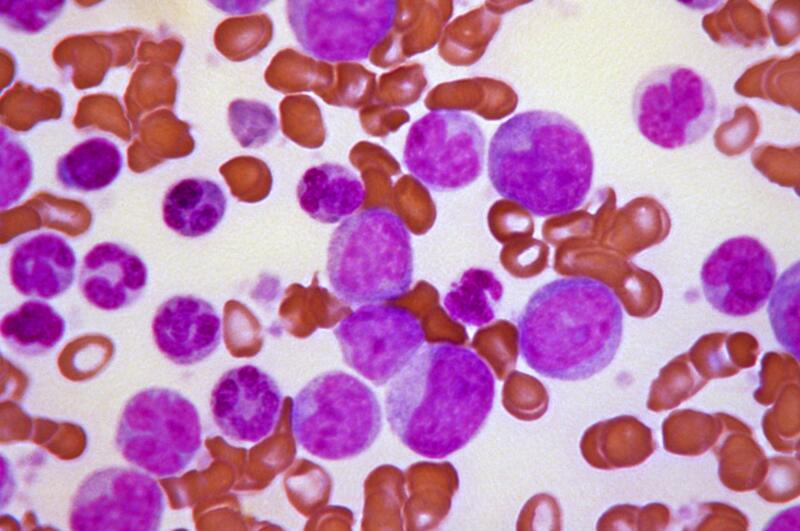 Chronic meyloid leukaemia blast crisis by CDC/ Stacy Howard. 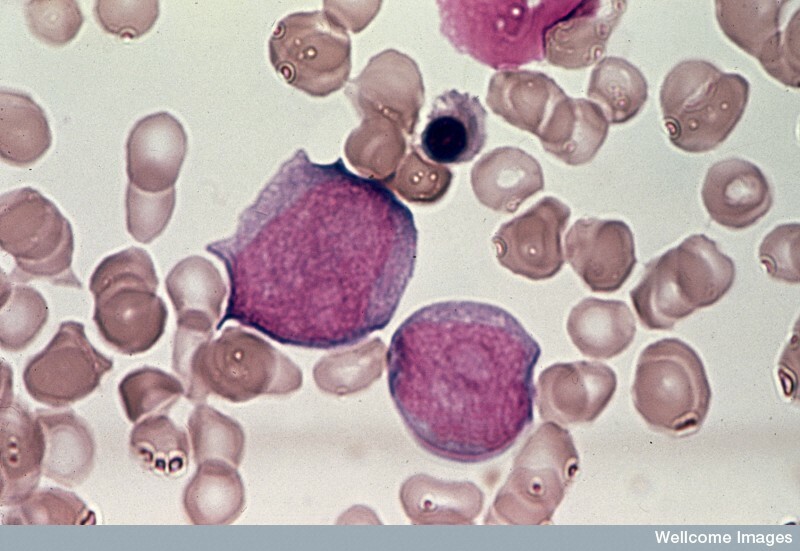 Acute leukaemia blood sample image by Wellcome Images. Leukaemia patients demonstrating chemotherapy procedures released into the public domain by Bill Branson. A bone marrow transplant is a stem cell therapy! The first one was carried out by E.D. Thomas in the late 1950s on a leukaemia patient using bone marrow from an identical twin. Chronic myeloid leukaemia (CML) is a cancer of the granulocytes and is common in people who have been exposed to radiation. In this smear of peripheral blood from a patient with CML, the pink and purple cells are the white blood cells and the smaller, greyer cells are the red blood cells.